Come on out to the friendly ski hill in the forest! Falcon Ridge Ski Slopes invites your school group for a memorable day of skiing, snowboarding and tubing. Adventure, physical activity and the outdoors are what we’re passionate about here at Falcon Ridge and we know many students rarely get the chance to ski. Let our energetic and knowledgeable staff provide equipment and instruction for safety and fun. We’d be thrilled to play host. 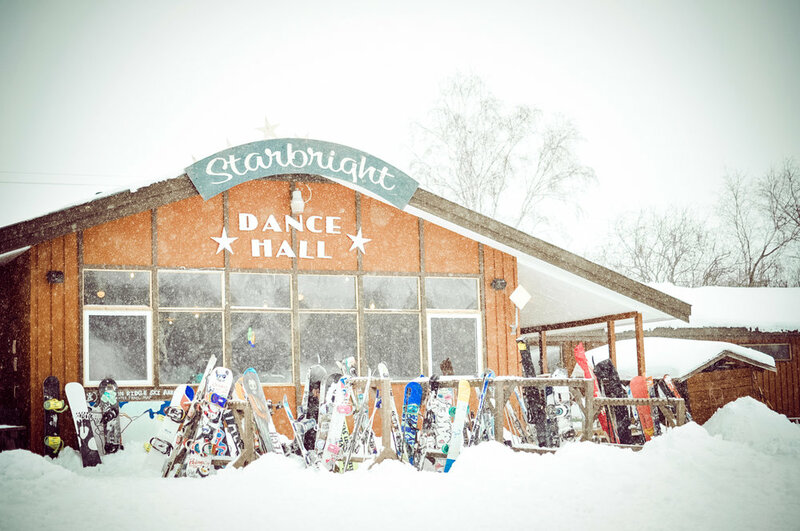 Students can choose from downhill skiing, snowboarding, tubing and sleigh rides – all surrounded by beautiful pine trees. When the day calls for time indoors, our vintage chalet is a cozy place to warm up, complete with a stone fireplace with a crackling fire. The Falcon Ridge café serves up hot chocolate and hot food. We offer mid-week group rates for schools interested in coming out and fostering a love for the outdoors and winter sport in their students. Group gathers for a short welcome and safety talk with our friendly and fun Ski Patrol team. Students try on their requested rental equipment and helmets (We help you collect shoe sizes in advance to speed things up). Students who are skiing or snowboarding will head to the beginner lift to get their bearings and take part in a group lesson, led by one of our professional instructors. The lesson is included in the price. Once a student has shown their skills and is ready to “graduate” to the bigger runs, Ski Patrol gives them a blue sticker on their helmet, which means they are ready to hit the big time! Throughout the day, staff and Ski Patrol are on the hill, looking to give a hand to students who are new to the sport. Lunch is served in the chalet. Groups either pre-order lunches at a special rate, order from our regular menu or bring their own bag lunches. When the ski day is done, equipment is returned to the rental shop. Everyone packs up and loads back onto the bus after a great day in the woods. $16/student. Student brings their own skis or snowboard. We provide lift ticket, plus a helmet, if the student doesn’t have one. $350 flat-rate for 4 hours of horse-drawn sleigh rides with a real cowboy or cowgirl from Falcon Beach Ranch. The ski day starts off with a one-hour group lesson where the basics of controlled skiing and snowboarding are covered. Our expert instructors show students how to use the lifts and get down safely. OPTION 1: GRILLED ON THE HILL! We’d love to host your group and since we know it can be a lot to coordinate, we’re happy to help in any way we can. Perhaps you are looking for a multi-day package including accommodations? Please get in touch! For more information, email groups@falconridgeski.com or, give us a call at 204-349-8445. We’d love to hear from you!